Turning up at the marina, I’m not quite sure what to expect from the planned rowing experience. It’s a beautiful day, the water is calm and I’m greeted by the boat captain and his team. We waste no time, jumping in and starting the row. 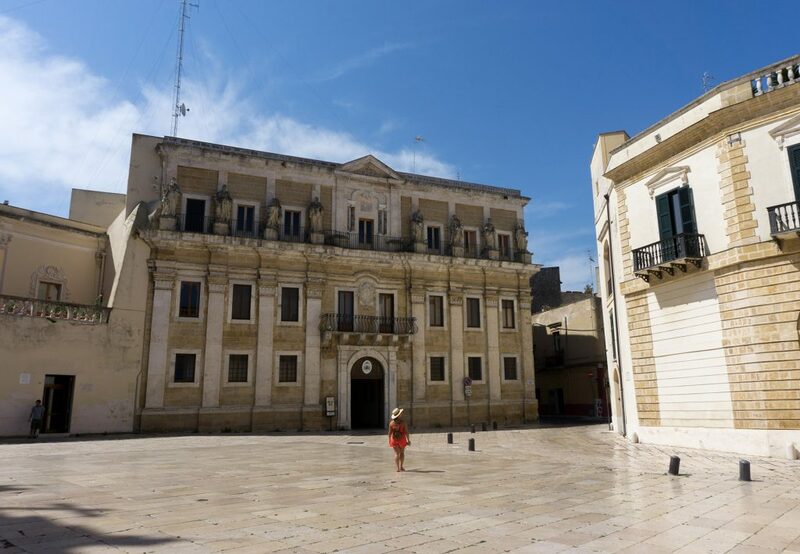 Can you think of a more unique experience to do in Brindisi? What about if you enter an internal courtyard in that row boat and have a private tour of a completely empty castle? That’s exactly what we did. The guys and girls from Vogatori Remuri rowed straight through the ancient arches and let me out at Castello Alfonsino for my very own Game of Thrones style moment. An isolated view back over the city of Brindisi, very special as there was no one else around and it was an amazing photo opportunity. On the way back to land, I tried my hand at rowing myself, even giving the team orders! The wooden oars were a lot heavier than I thought, but I suppose that’s because the rowers make this physically demanding skill look so easy. At the front of the boat you lead the others, so they need to keep up with your pace and rhythm. I have to say, we moved a lot slower when I was in charge and a couple of times I nearly lost grip of the oar completely – this is an activity that requires a lot of core strength. 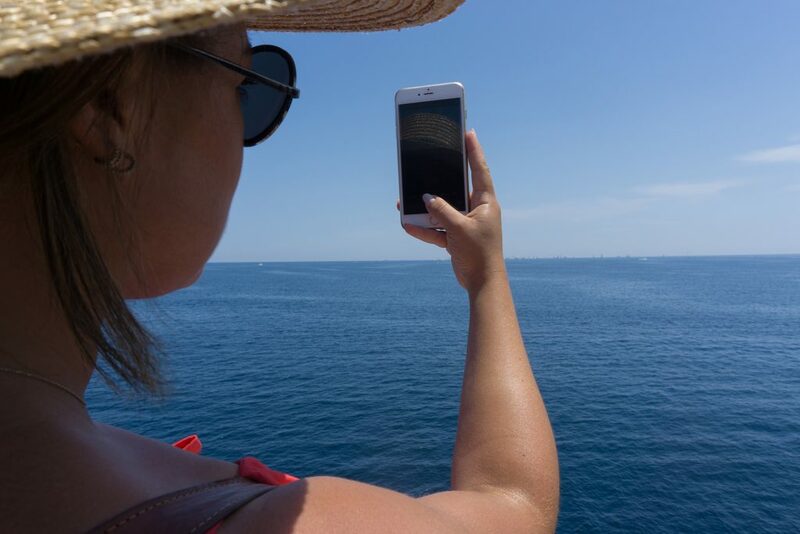 We swapped back places and I resumed my role of sightseeing and taking photos, then I exclaimed “andiamo” and we sped towards the home straight. Being so close to the water offered a unique perspective of my surroundings and this was one of my favourite experiences in Brindisi. You can see the ‘big rudder’ that is the huge stone monument at the National Sailors Memorial from so many different vantage points in Brindisi, but for the best views head straight to the top! At 54 metres tall, this symbol of the city is a must-see and entrance is free which is a bonus. Ascending the oval spiral staircase, I marvelled at the beautiful architecture of the monument built in 1933. From the rooftop, you will have 360 panoramic views and the best spot for a photograph of the waterfront. See the many types of boat move through the harbour from cruise ships to small sailing yachts, then visit the chapel at the base of the monument to pay respects to the 6,000 fallen sailors who lost their lives during the First World War, for who the memorial is dedicated to. 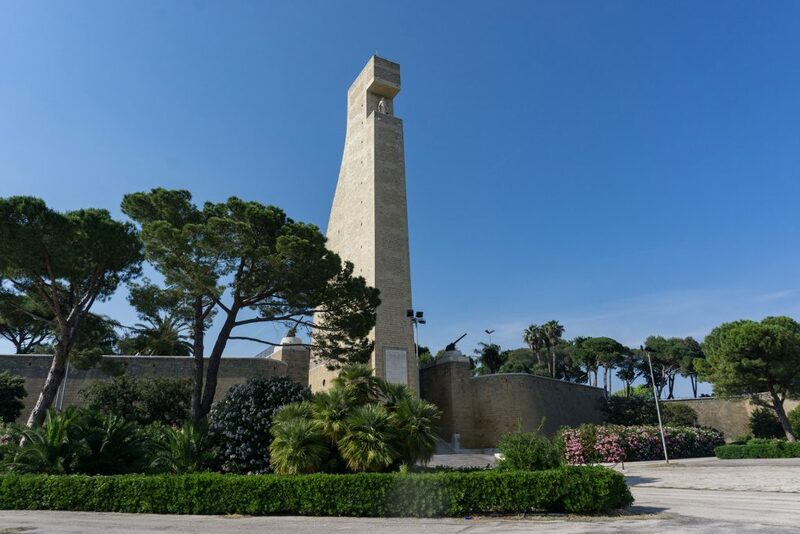 Here, you’ll also find the original bell from the battle ship “Benedetto Brin”, which sank in the port of Brindisi in 1915. For nautical or maritime enthusiasts like myself, it was interesting to see the the huge anchors at the base of the monument which are relics from Austrian battleships. Elsewhere in Brindisi city centre, I took a stroll through the artisan bazaar stalls on a pedestrianised street. The local craft market stalls sell all kinds of handmade trinkets that make perfect souvenirs to bring home, I especially liked some of the jewellery and enjoyed cooling off in the shade before taking a rest at the fountain. The streets are so clean and safe here, just walking around is a joy! Given its geographical location, it’s unsurprising that the gastronomy in Puglia is heavily seafood led. But being the carnivore that I am, dinner at Braceria Semeraro in Brindisi was an absolute treat. 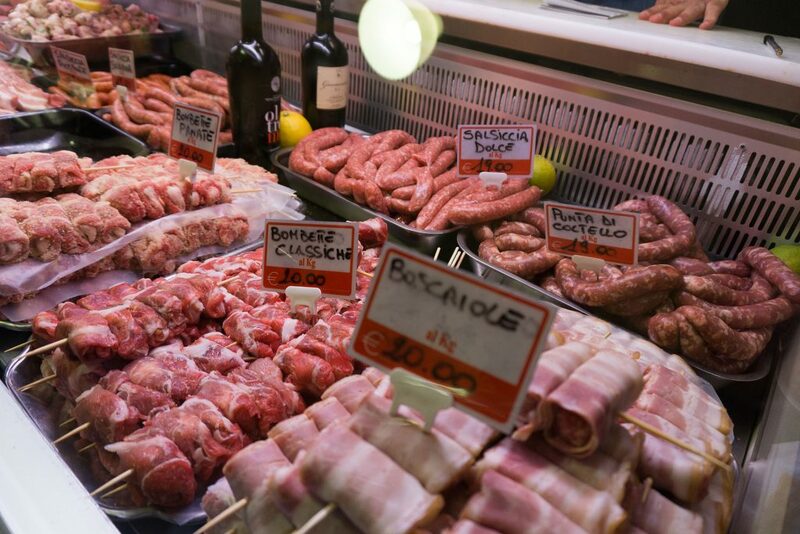 The idea is simple, a butcher counter with quality cuts of raw meat that you can choose to have cooked to order, with a couple of humble sides. So simple in fact that I can’t believe I’ve never seen this idea executed anywhere else, but there’s a similar restaurant just across the square and they both appear to be very popular! I spot some Irish Angus beef and the chef proudly shows me the label, the quality of produce is hard to beat. The square is filled with families and friends, all dining al fresco. The mild evening breeze and slightly chilled red wine cool us down for the feast that lies ahead. I try not to fill up too much on the chicken and chips (an odd starter where I’m from!) that arrives at the table first, instead saving space for the lengthy list of delicious meats we’ve ordered. I do indulge in some local olives though, they’re so hard to resist and are perfect to whet my appetite! Everything is cooked in the finest quality olive oil or drizzled with more at the table. The Italian sausages, or salsiccia, are firm favourites among our group and we spot another party having a huge joint of beef carved directly at their table, it’s a foodie heaven! Our meat is served with a light simple salad of rockets and tomato that compliments the steak perfectly. The meat feast doesn’t leave me with any room for dessert, but what I do try is an after dinner digestif, a typical amaro herbal liqueur. I’m blown away by the value for money at Braceria Semeraro, for such good food you’d expect a much bigger bill! Arriving at Guna Beach, I’m surprised by the Caribbean-like white sand, turquoise sea and gentle breeze. The beach stretches as far as I can see and the water is crystal clear and very inviting as the temperature starts to rise. The stand up paddle boarding instructor comes over to greet us and talks us through some of the principles of SUP. While I’ve tried it before, I find that each different instructor has different tips on how to keep your balance and tricks for not falling in! The board is wide and the waves gentle, so we head out into the water to give it a go. Starting on my knees I wade out enough to pass the tiny breaking waves and when I’m steady enough rise to my feet. I’m reminded which direction to paddle in and to keep looking straight ahead or at the horizon rather than down at the board which really helps. When I inevitably do lose my balances, the refreshing dip cools me down enough to try again. 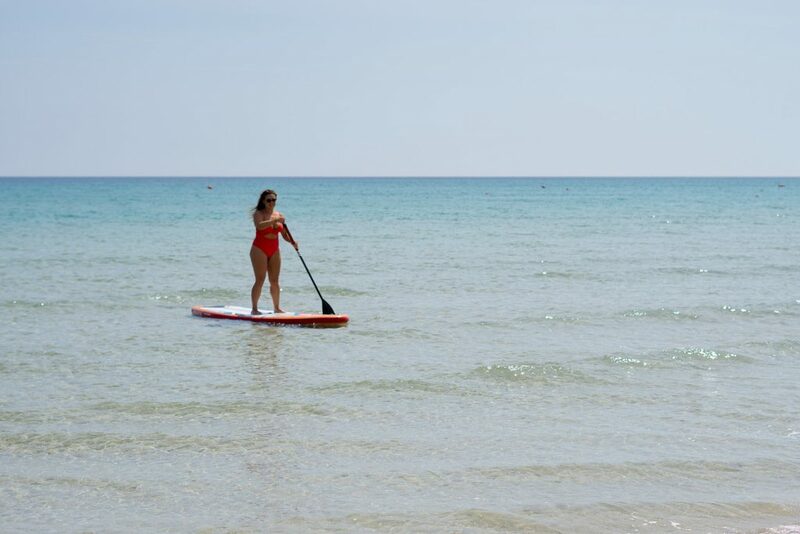 Stand up paddle boarding is a lot harder than it looks, but a lot of fun especially when you’re in such beautiful surroundings. I definitely earned a post-activity Aperol Spritz at the Guna Beach Club though. There’s an outdoor hot tub, massage area and lots of comfy sofas and day beds to relax it. Give yourself lots of time at the beach because once you arrive, you won’t want to be in any rush to leave this paradise! When I turn up at the ExFadda community centre, there’s lots going on, yet it’s still an oasis of calm. The converted 1950s stable building has huge high ceilings with bespoke art and light fittings filling the space indoors and making use of the original arches. Out the back, there’s a small group learning how to make clay pizza ovens and another project focuses on guitars. Inside, I watch a couple performing a contemporary dance and behind a sound-proofed door an incredible singer practicing with her partner who’s on keys. Talent literally behind every door! There’s also a yoga platform and furniture workshop dedicated to restoring vintage pieces found at flea markets around the area. In the Xfood community restaurant, you’ll see some of these one of a kind restored items and in fact, everything is available to buy. There aren’t any price tags though, just make your best offer. Lunch is a never ending assortment of small plates to share, followed by seafood pasta. If you’re not used to antipasti, like me you’d think that this was the main event, there’s just so much food, but it’s actually just the first course! My favourite dish is fava bean mash with roasted peppers in delicious olive oil. 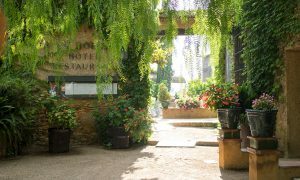 Everything is served on pre-loved plates and china, all ornate and different to the next and the menus use fresh herbs from the gardens and local seasonal produce. Some of the staff with learning disabilities have undergone training programmes with ExFadda to teach them the skills they need for the workplace and everyone is from the local community, so there’s a lovely spirit of camaraderie and everybody has a purpose. 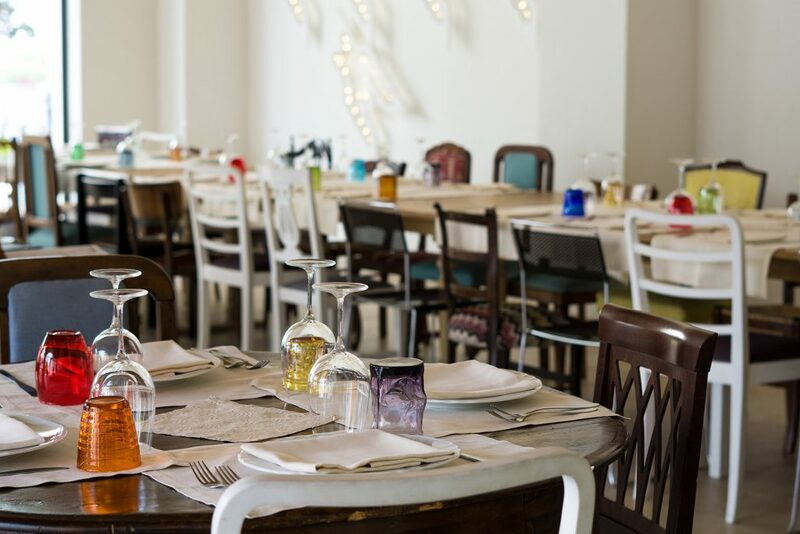 While Xfood is a community restaurant, anyone can go for a meal in the converted space and enjoy the warm welcoming staff, tasty menu and stylish eclectic surroundings. Driving through the countryside in Brindisi, it would be difficult to miss the rows of vines in the Negroamaro area that are grown to produce high quality wines for local consumption and to be exported outside of Italy. Puglia was the biggest wine producing region in the country in 2016 and 70% of the output is exported overseas; mainly to England, Scandanavia and Germany. Being in the region, it would be a shame not to visit one of the many local wineries and vineyards to learn more about the production and of course taste the wine itself. At Cantine Paolo Leo, in the heart of Salento, I take a tour of the family-run business learning about its historic roots right through to the modern day production line. We’re walked through the production process by the young winemaker who explains the steps from the vines all the way through to bottling (about 6,000 bottlers per hour) and labelling and even local and international sales. 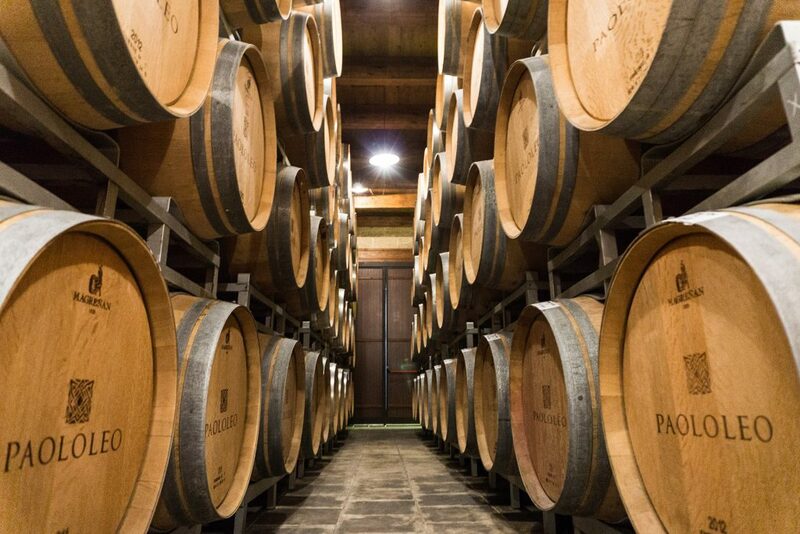 In the barrel room, the smell of French and American oak fills the area, maturing some of the Paolo Leo wines from between 4 months and a year. When it comes to tasting, I admire the many many awards adorning the walls, they’ll soon run out of space as it’s evident that this is a very well respected wine brand. We try the light, every day Negroamaro wine and the more full-bodied Passo del Cardinale Primitivo. Leave some room in your luggage, as you’ll want to take a few bottles home! Every year, more than one hundred sail boats and their teams flock to Brindisi for the annual International Brindisi-Corfu Regata and it’s a highly anticipated event both for locals and visitors. 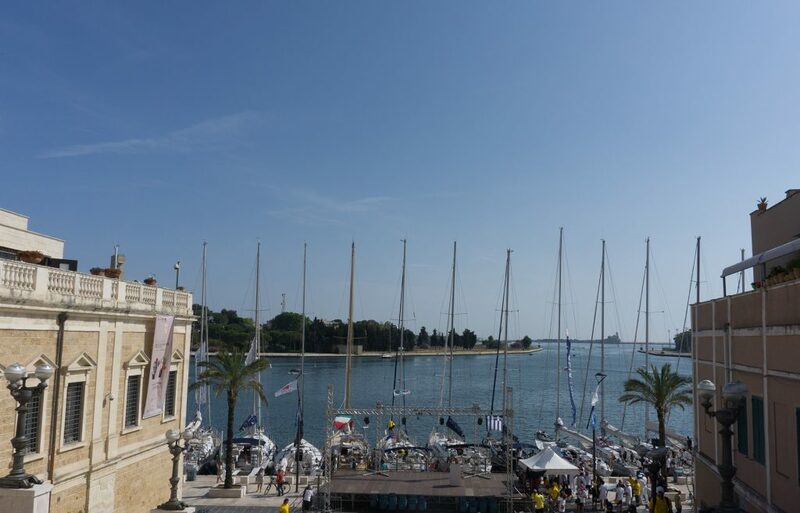 The atmosphere is electric at the port where the boats line up in the days leading up to the race and teams of sailors spend time in Brindisi. 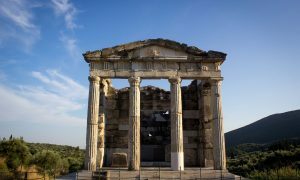 Catamarans and monohull yachts all gear up for the regatta which takes place over the course of a weekend, starting with an opening ceremony on the waterfront in Brindisi and finishing with the winning team awarded in Greece. The stage is set and speeches are made, everyone spends their time out walking along the boardwalk, admiring the boats (and their captains!) excited for the official start. The area is particularly photogenic just before sunset when the masts contrast against the changing night sky and twinkling lights. If you want to wave the boats off, at the official start of the race, I suggesting taking a bike or scooter down to the end of the long pier, as no cars are allowed through and the start takes place during the scorching midday sun. 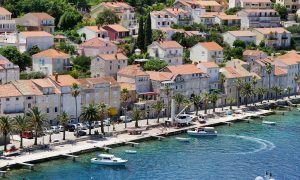 For anyone interested in boats or with a love of all things nautical, the lead up and weekend of the International Regata Brindisi to Corfu is the perfect time to visit, perhaps you could even join a team and compete yourself! The race must be completed within 35 hours and the winning boat awarded at a prize giving ceremony in Gouvia Marina in Corfu. We meet our guide Daniele from Eliconarte at the symbol of Brindisi, the Roman columns. He starts the tour by explaining their significance and talks about why only one of the columns is intact and we’re left wandering what happened to the other until the end of the tour. I learn about the significance Brindisi’s natural habour had as a trading centre and the importance of olive oil production and export through the ages. We move on to the Archaeological Museum where numerous finds from excavations throughout the city can be found. I see casks that would’ve been used to transport olive oil and remains of other historic items, such as the bronze sculptures which were found by divers in the waters of Punta del Serrone as recent as 1992. Here at the museum there are four rooms dedicated to Brindisi in the Roman age, where you will find ceramics and a scale reconstruction of a trade ship’s bow showing these amphorae (tall ancient Roman jugs with handles) as they would have been stored while transporting goods. I’m amazed by the Roman ruins under Teatro Verdi. The theatre was built over Roman remains and mosaics that were discovered during building works and can now be visited. At the end of the tour we come full circle and see the very well preserved original top of the column in the museum of the Palazzo Granafei Nervegna depicting Neptune who faces the sea and Jupiter, Mars and Minerva on the other sides. I finish off in the café with my very first ‘Rustico’, a traditional Italian puff pastry snack filled with mozzarella, béchamel and tomato sauce. We pick up our electric bikes (and a tiny Twizy electric car for me!) at MadEra base at AlbergaBici in Moltanbano in the Regional Natural Park Dune Costiere and set off for our rural olive oil tour. 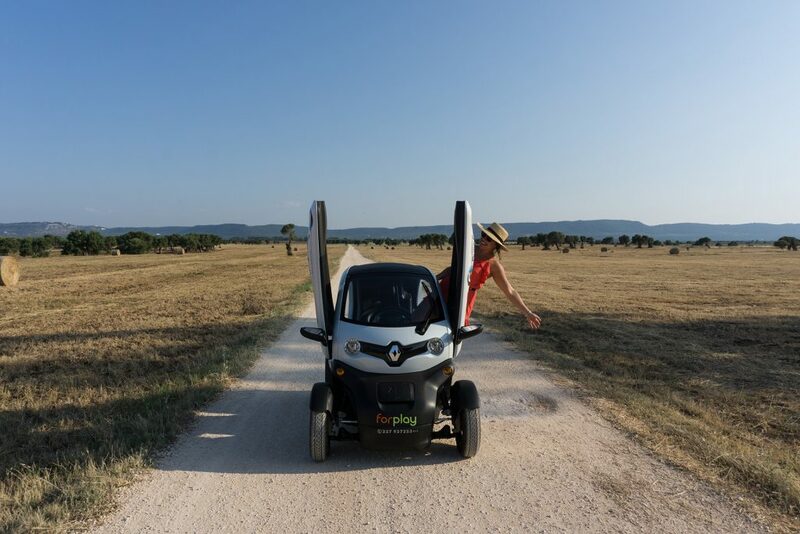 It’s an incredibly unique experience passing through an ancient olive grove plain in a hi-tech, environmentally friendly vehicle. At each stop, we learn about the history of olive oil from the cultivation to the harvest of olives. 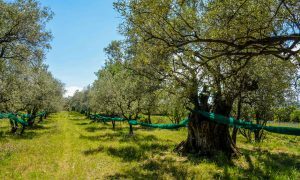 Puglia has over 60 million olives trees, producing 40% of Italy’s olive oil and It’s so impressive to see such history in front of your eyes. The trees are not only hundreds of years old, but some are thousands and are such a huge part of the history of the area. The tour takes about 3 hours and covers 10km of ground and we finish off at a local olive oil producer’s mill to see the production line and have a chance to taste the finished product. We walk through the press where the oil is produced and see the machinery that is used to extract the oil from the olives. It’s the perfect end to our educational and enjoyable tour, as we mingle and taste the different types of olive oil and have the chance to purchase some to bring home too. It can even be ordered to ship back and we were stunned by how low the prices were for such a good quality product. And as if it was planned, the family’s adorable goat showed up just as we were leaving, providing the perfect photo opportunity. A food photographers dream. White washed walls, accents of colour, dappled light and delicate plants and flowers. 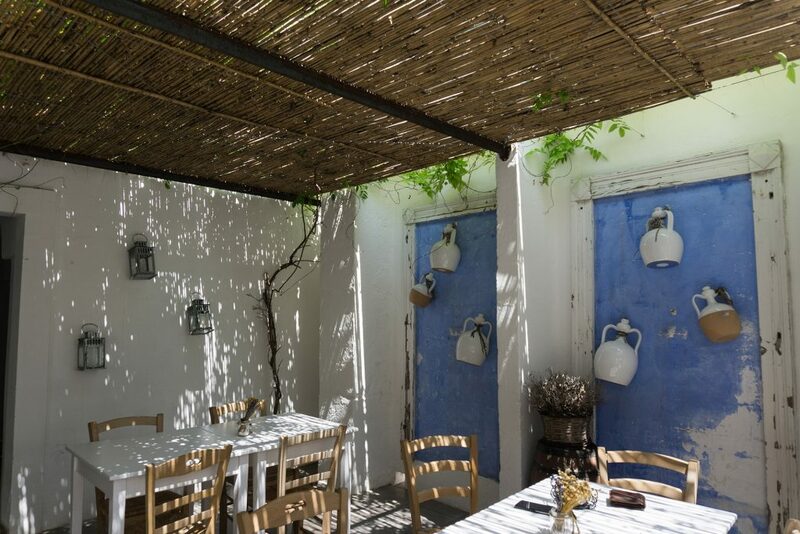 The quiet courtyard behind the unassuming green doorway simply labelled ‘Trattoria’ is a hidden gem. We find a shaded table and order some light blush rosé wine and start with a refreshing chilled beetroot soup. The ricotta with pistachio is a favourite, as are the tiny meatballs, meats and cheeses with jam and walnuts and the pasta course is perfectly al dente spaghetti with pumpkin and doesn’t disappoint. For those with a sweet tooth, the dessert options are to die for, especially the berry bombe with white chocolate shell and mint. Everything is fresh and locally sourced and the service was perfection. There is a traditional element to the food of this restaurant but with a modern edge and although there’s an authentic aesthetic, it’s balanced with a clean up to date feel. Delicious Pugliese cuisine, perfect portion sizes and excellent value for money. There are some slightly more unusual options on the seasonal menu and the food presentation really steals the show. Shaded by trees, dining under a canopy, the setting is very relaxed and welcoming. One of my favourite meals in Brindisi, Il Cortiletto is a must-visit if you’re in the area.